During the month of November, I conducted an experiment with turning off blog comments. You can read my original announcement post on that here. In the post, I mentioned the pressure that is often associated with blogging and comments and page views. I wanted to see if and how turning off comments would affect the way I blogged. I will start by saying that although I am very glad I tried it, I will not be turning off comments on this blog. Surprisingly, I found that there are many pros to turning off comments. There is, however, one giant con: if you turn off comments, you won't get any. Thank you, captain obvious. But more on that later. First let's start with the pros of this experiment. No comments = no emails. Hurrah! Instead of constantly checking my inbox for a new comment, I almost completely forgot about it and checked maybe a few times a day. It was kind of revolutionary. I suppose this could be a good thing or a bad thing depending on how you look at it, but something I noticed was that when I wasn't getting comments on my posts, I felt less desire to visit other blogs and leave comments. I still read blogs, but I definitely commented less. Maybe this is just me, but if someone leaves a comment on my blog, I try to visit their blog and leave a comment back. This doesn't always happen, of course, but especially for the people who consistently visit my blog, I just think it's nice to return the favor. That's not to say I want people to feel like the only reason I visit their blog is because they visited mine, but I do see blogging like a friendship of sorts, and friendships work best if both people make an effort to be friends. Someone could have the best blog ever, but if I've visited and left comments and even linked up with you, and you never reply or visit my blog? Goodbye. This is ridiculous, but I'll just be honest: if I am consistently getting 20+ comments on a post and then I write something and it only gets 5 comments, I do feel bad. I start wondering, What was wrong with that post? Why did everyone hate it? Why is my follower graph on Bloglovin taking a nosedive into a fresh blogging grave? Why does everyone hate me? Why am I even blogging at all? You can see how this line of questioning is completely unproductive, not to mention dramatic. When I turned off comments, I felt the weight of comment anxiety lifted from my shoulders, and it was awesome. It also served a double purpose of making me feel LEGIT when I published my next post and turned comments on. Since I'd gotten a big fat zero on my previous post, I felt like a blogging rockstar when I got 5 comments. Perspective for the win. Okay, so those were the biggest pros to turning off comments. But again, the one con pretty much outweighed all of those. The truth of it is: I missed getting comments. And if the feedback I got from some of you on this experiment of mine is any indication, I think you missed having an easy way to give them. Sure, you could email me or tweet me (and some of you did, which I loved!). But for the most part, I didn't see a huge jump in "shares" or emails or tweets. You probably just read the post (or not) and moved on. I felt bad denying you an opportunity to comment if you really had something to say. For the record, on the posts where I turned off comments, I had a noticeable decrease in page views. My theory (although there's no way to prove this) is that a lot of you read my blog in email or through a blog reader like Bloglovin or Feedly. If you aren't going to leave a comment, you don't click through to the actual post, so a page view isn't registered on the stats. Again, that's just my theory. I'm so glad I did this experiment. If nothing else, I feel like it gave me some much-needed perspective on blogging. Listen: stats aren't the end of the world. When I wrote my first Blog Talk post about how to get more comments, I said that leaving comments and replying to comments is the best way to get more comments. I still believe that, but I don't think I feel as strongly about that now. Or, I guess maybe I should say that I don't feel as strongly about doing any and everything to rack up my number of comments. Comments are fun, but they aren't everything; and we shouldn't judge our worth, our writing ability, or our blog's awesomeness on the number of comments we do or don't get. That is the first thing I learned from this experiment. Here's the second: Instead of focusing on how many comments you didn't get, try being thankful and excited for the comments you did. Do you know what a comment means? Someone took time out of their day to come to your blog, read your post, and find something relevant to say about it that they wanted to share with you. Whether it's one person or fifty, that's pretty darn cool. Especially when you consider all the other blogs that are out there they could have been reading instead of yours. I would be very interested to hear from any of you who have thoughts about my experiment! Feel free to leave a comment below with feedback on my experiment, questions about what I've discussed in this post, or to just say hi! When I sit down and really think about it, I always conclude that blogging is weird. However, I don't think we would have anxiety about stats, comments, and checking our email like mad women if we didn't truly enjoy blogging. I liked your experiment! I enjoy responding to blog comments, but I agree it can be time consuming. When I see how many comments you get per post, I'm always impressed that you are able to respond so quickly and person-ably. I'm not surprised to read that you had more free time on your hands when comments were turned off. I love your reminder to be happy that people took the time to comment at all instead of worrying about how many comments were received on a post. True that! Thanks for sharing the results of your experiment! hmmm i've been curious to hear your response to the experiment. i do like the "less pressure" pro...there is something nice when the pressure (in any way) from blogging is relieved a little! This is interesting because I realized I hadn't really been commenting like I used to this month, even though I have been reading in my feed and stuff. And now I realize I missed the comments off post! Haha! Of course! I really enjoyed reading this! Like you said: being an active commenter on your own blog and other people's can take a lot of time -- especially if you really actually read and leave personalized and thoughtful responses! Which you do! You and I have similar commenting philosophies with that and also with visiting blogs that come to your site, too. I try to get back around on my own without them commenting on mine, too, but I have found the reciprocity easier to keep up with. But I do sometimes feel guilty when I realize: "OMGosh! Haven't been to that blog in forever!" Or I feel bad a little right NOW too because I am behind in reading some of my old favorite blogs and commenting -- but I think because I want to really comment and concentrate, I have been just lurking on other blogs and reading those. Anyway, I agree that even though there are all those pros, one or two heartfelt comments totally makes it worth it! Comments have been one of the best parts of blogging for me and I love them -- leaving and receiving them! Some comments have truly touched me and changed my life! When you think about that -- somehow finding these rare connections out if all the people in the world, that is humbling and powerful! What a beautiful and wondrously made universe we live in! Just gets more and more amazing! So, I don't know if this happens to you, but sometimes I put off reading a blog post that I know I want to read carefully and spend time commenting on, and I will instead read a "fluff" post that I know won't take as long. Then those posts pile up and I get stressed out! haha. Problems. I get behind on reading blogs, but there are SO many blogs out there and not enough time. That's one reason why it was kind of nice to turn off comments, because I didn't feel bad that someone had come to my blog to comment and I never had time to go say hi to them. But I appreciate what you said about my community. The Lady Okie will never be blog famous, but I really do enjoy the community I have built here. It was a lot of work, but I feel like I've made some good friends, and it's been a ton of fun. I get turning off comments on occasion, particularly if a post is somewhat controversial and you're not interested in moderating a debate. But when you announced your experiment and were all "reach out to me on other forms of social media..." I was like, no. No way; and I'll catch up in December. This right here is the platform I choose to connect with you over, period. I also have that same sentiment toward bloggers who close the Anonymous commenting option (and Disqus, to be honest) and I do generally stop reading them after a short while. I don't mind if you have a picture of who I am (that anonymous commenter who grew up two or three towns over from you..not sure if you're from the "-on" or the "-field" but those are my guesses) but I don't need or want to leave a reading trail across the internet. Anyway, that's far more than my $.02 and I am going to check back later because I'm interested in hearing what other bloggers thought about your experiment! I was nodding along like a bobble head through this post. I did just read the blogger view of the post and didn't click into the original when I knew I couldn't comment. I was really excited when I saw that I could comment on a few through that month. I totally agree about building a friendship through blogging and there is give and take - I'll comment on the blogs of people who return the favor and put effort into the friendship and with only one or two exceptions, I've stopped reading blogs on which I have commented with no attempt to make a connection on my site by those bloggers. Comments are fun. I'm glad you shared your findings! I'm so glad you turned them back on. yes, it's more time consuming, but, I feel like commenting is how relationships are built. I don't want to just write to noone, I want to build friendships, correspond with others, etc. If it weren't for commenting, I wouldn't have so many close blog friends as real life friends now! I like it!! I can definitely see myself trying something like this. I would definitely miss the interaction but sometimes the number of comments you get or don't puts a lot of pressure on you. I did experiment a little by scaling down comments on other blogs and I found that I didn't get as many comments on mine. It was disappointing at first but then I felt okay about it because once you get that post with only 3 comments (as opposed to 16) the pressure on the next post is gone and you start to care a little bit less and for me that is a really good thing. The comment for a comment thing is real! I do get it though. It's only fair. this is really really interesting. i have a really hard time knowing if i actually WANT more comments or not. i do think you lose something by not allowing comments but I can definitely see the benefits. awesome post. This was an interesting experiment, but I'm really glad you aren't going to be turning off the comments. I know I enjoy reading them along with the post, itself. I also agree with you about creating blogging friendships. A girl commented on my blog a while back, so I went to check hers out and I LOVE it. It's one of my favorite blogs, now. To me, comments aren't so much a way to "gauge" your success as a blogger as a way to connect with other people. On one of my other favorite blogs, readers comment back and forth amongst each other and it makes for an awesomely dynamic reading experience -and I think it takes some of the pressure off the blog author because no one gets neglected (as long as they don't comment SUPER late in the game after everyone's moved on). This was really interesting to read! I have to say I laughed at the part "why do I even blog at all?" I know I've felt like that sometimes and your post offered such good perspective on the whole thing! I love the reminder that you wrote about- a comment means someone took time out of their day to stop by, read your blog, and comment. SO TRUE. That was also really interesting about that your page views decreased on the ones that you had comments turned off- I would probably agree with your theory! 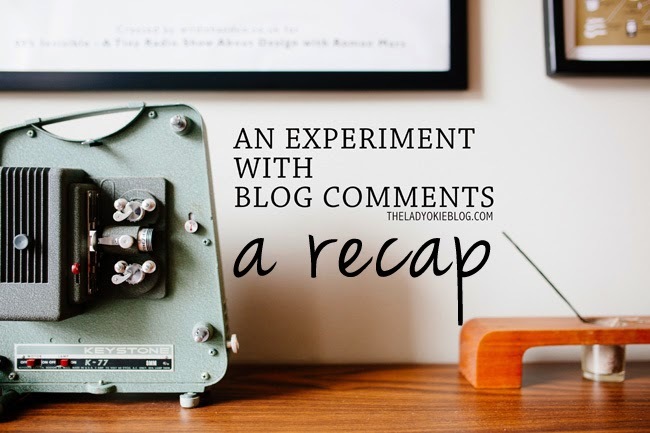 Thanks for sharing your thoughts; it definitely sounded like an interesting experiment! I'm not a very serious blogger and mostly blog to keep track of my own thoughts. A virtual scrapbook, if you will. For me, comments are lovely and sweet, but since I'm not focusing on growing my blog or anything like that, the stats are not really a focus point for me. That being said, who doesn't love when someone interacts? I can definitely feel where I start to wonder if anyone likes my blog at all, if I should be focusing more on growth and stats, if I want to turn this thing into something serious, and so on. Your experiment reminds me to keep my blog true to me. Post what and when I want to post, and focus on my own goals, not goals of other bloggers. No pressure. Keep your comments on, but keep the pressure off. Thanks girl! I love that you are willing to do experiments with your blog. As a fellow blogger, it's fun to see how it turned out and then take inspiration from you and others and maybe try my own thing. Not this particular topic, but others like the idea of surveying your readers. I appreciate your transparency and I agree that it is a little annoying when bloggers don't reply to comments. I try to reply to every single one I get. I hope this experiment took some of the pressure off! i have thought about disabling comments just because sometimes i get so overwhelmed with responding to all comments (even though i barely get any! ha! i can't imagine how many you have to respond to) - but one of my favorite things about blogging is interacting so i would probably hate blogging if i couldn't interact with people in comments! I am so with you about the blogging relationship thing. There is definitely a give and take. If I regularly comment on a blog and don't hear back - I don't stick around. I like to have the option to leave comments because a lot of times I have something specific I want to respond to in a post. But sometimes I even leave comments when I don't have anything super insightful to say. Someone made a delicious meal and shared it? I want to throw out a "congrats!" or "it looks delicious" because (while those comments aren't super deep), it lets them know that I'm there. That they aren't just talking to blank space. Comments are the best feedback. As much time as it takes, it really allows that connection you wouldn't get otherwise. I'm so happy comments are back on. This way, you come to my blog e'ry day after I comment on yours, you see how cool I am and how much we have in common and we become IRL friends. Ah, crap. I've given away my plan. I love that you did this experiment. Prior to starting my own blog I read blogs but wasn't a huge comment type of person. Once I started blogging myself I started commenting more. I do think the comment section is a great platform to begin new relationships and that's awesome. I read your blog through Bloglovin and rarely click through to comment. My thought process is that I'll never go back to check if you respond, so why bother. That being said, I read every single blog post and consider your blog one of my favorites. That's so nice of you to say :) Thanks for reading, Jen! I don't have a very scientific personality, but I still found your results of this experiment very interesting. I think I'm more of a social writer than a writer 'just for the records'--i never kept a regular journal, but before blogging I used to send my parents really, really long emails on a daily basis containing the tales of random adventures--I think I've always enjoyed seeing people respond to my writing. When I started blogging, my relatives commented often, I recently came across a ridiculous epic poem involving Humpty Dumpty the egg that my brother commented on one of my early posts, and it cracked me up. With my new travel blog I have a theory that it's the sort of blog that will attract higher pageviews but significantly lower comments, just because of the nature of the niche. We shall see what happens. I'm glad you did the experiment, and thanks for sharing your results with us. However, I'm even more glad you decided to keep comments. One of the main reasons I like the internet is because I can give feedback on just about anything I read. If I watched TV, I would just be listening to what other people say and think, and what they want me to hear--that's one of my reasons for not watching it often. So reading a post and commenting go hand-in-hand for me; if I can't give my two cents in reply, I often won't read a post. I can see how closing comments can be good for some posts, but I don't like the idea of comments being closed often. I see what you're saying about TV. I think comments are such a fun and easy way to engage with people, start a conversation, and make new friends! Very interesting!! So did you miss me from commenting in november? LOL. Okay--in all seriousness, I love that you did that. Is it weird that I get annoyed when there are blog posts that don't allow comments? haha. I do see both sides and can see where not allowing comments does take pressure off, but I agree, connecting with people, whether it is 2 or 40 is better than none at all. And I love what you said about being thankful for the comments you DO get. :) I feel the same way! I also think it's easy to read posts and move on with some posts (i.e. the "fluff" posts you talked about with another blogger--blog snoop much? haha) but I also think that some bloggers welcome comments better than others, too. Commenting takes work! That's why I try to appreciate the comments I get, whether it's 2 or 200. Someone still took time out of their day to leave a comment, and that means a lot to me. It's definitely easier to respond to some posts over others, but actually I find it easier to comment about serious, hard stuff than fluff sometimes. I mean, leaving a comment about 5 tips for such and such is kind of blah. I love when I can really think about a post and leave a meaningful comment. I just wish I had more time in the day to do it. Yay yay yay I'm glad your comments are back! :) Also, just curious: Do you respond to EVERY comment you get? I used to, but now I only respond to comments that are asking a question or if I have something else to add the conversation. Personally, I don't care if a blogger just says "thank you" to a comment I left (that's just one more email haha), so I try to follow a "would I want this email?" strategy when responding to comments. Now I'm curious to hear what everyone else does! I'd say right now I respond to about 95%. There are a few here and there that I either can't respond to because it's a no-reply blogger or something, or it's a comment that I just can't think of anything to say back, so I don't. Honestly, I have built a pretty solid group of readers, so the majority of my comments are people offering thoughts on things that I definitely have a reply to. And I think it's nice to acknowledge that I did get their comment. But yes, sometimes I get behind or whatever, or a comment isn't really adding anything to the conversation, so I don't reply back. I'm sure in a different stage of life I will not spend as much time replying to comments. It's a lot of work! I'm glad your comments are back! I feel like there is a missing piece to blogging without the comments. Of course I'm sure from the responding side it was a NICE break. Yes, I read most of the time from Feedly and only click over to comment...so that makes sense about the page views. Yay for comments otherwise I never talk to you. :)! Interesting results from the experiment! As a reader it definitely feels awkward when you can't leave a comment, and I've noticed blogs that have their comments turned off have less followers/friendships from the blog. It starts to feel like a one sided show, when I think most people turn to blogging for connections. Loved reading your thoughts on this experiment! I'm going to be honest - I'm glad you will leave comments on. I think it's nice to be able to comment, respond and connect. I thought it was a bit frustrating to read a post and think of what I would say in a comment and then not be able to.